Bishop Daniel Flores speaks to the media and guests Feb. 10, 2016 in San Juan. Bishop Daniel E. Flores of the Diocese of Brownsville issued a statement Wednesday expressing the sorrow of the Catholic Church regarding the 1960 murder of Irene Garza by a member of the clergy. “On behalf of the church, for the sinful actions of members of the church, I express this sorrow to the family, and to those whose faith has been injured by these events,” the message continued. John Feit, 85, who served as a priest in the McAllen area in 1960, was sentenced to life in prison on Dec. 8 after a jury found him guilty of Garza’s murder. An autopsy report confirmed that the schoolteacher died by asphyxiation, likely by suffocation. Addressing evidence introduced during the trial that suggested a conspiracy between the church and law enforcement at the time shielded Feit from prosecution, the bishop said he has no answers. 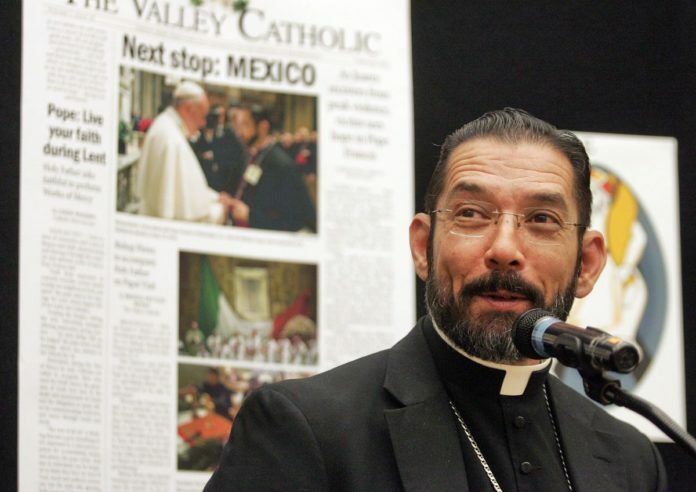 Jurors were shown an October 1960 letter between clergy officials regarding the case that suggested that officials feared bad publicity from the conviction of a priest would trigger political ramifications extending from the Rio Grande Valley to the White House. Rev. Joseph Pawlicki, a pastor at a church outside Austin, wrote to Rev. Lawrence Seidel, the head of the Oblates of Mary Immaculate order to which Feit belonged, urging him to hire a private investigator to find “loopholes” in the state’s case against Feit. Then-Hidalgo County Sheriff E.E. Vickers’ re-election chances and the presidential campaign of John F. Kennedy — both of whom were Catholic — would be at stake if Feit was charged in Garza’s death, according to the letter.